If the weather outside is frightful or delightful, these snowballs are a hit! 3) Poly-fil to stuff the nylon. 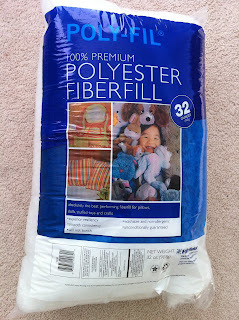 1) Grab a handful of the Poly-fil and stuff your stocking (just enough for one snowball). Then make a knot. 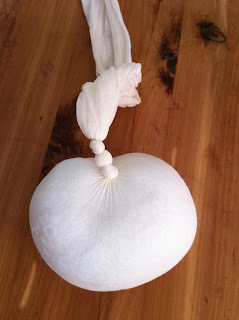 2) Make ANOTHER knot after the one you JUST made, leaving a little space between the two knots. 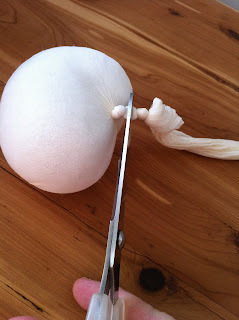 3) Cut between the two knots. 4) Repeat steps 1-3. Below is something you can do but you MUST remember to do step 2 or else you will waste a whole snowball. We made hundreds of these last year for a Christmas party we had. If you are going to have a snowball fight, divide the group of people into two teams and divide the snowballs equally between the two teams. Create boundaries. You can either put some masking tape down on the carpet to divide the room in half, or play on an indoor basketball court, or anywhere that has a boundary line. The teams must stay on their side of the line and cannot cross it. Set a timer. Let them fight for 5 minutes or however long you'd like the fight to go on. You can have "rounds" of fights if you'd like. This is a great game for preschool, play dates, Christmas parties, birthday parties, office parties, or at home with your own family. This is SO cool! Thanks for the idea, it's definitely a furniture-and-windows-saver and much better than the ping-pong balls we used to "fight" with. What a great idea. We just moved to where there is no snow and my kids are already missing it! These are perfect and I even have all the supplies! Thank you! Thank you! This is just what we have been looking for! Thank you! You are brilliant! Saved me money and time creating a field of snowballs for my daughter's Frozen birthday party. Everyone couldn't wait to play with them!